YorSpace is delighted to announce that FULL Detailed Planning permission was approved for our design proposals for our 19 homes at Lowfield Green by Planning Committee yesterday… the Committee unanimously voted in favour of our application with a string of supportive comments for our approach. This is a huge moment and we’d like to take this opportunity to thank EVERYONE involved in getting us this far… all our Directors, members, funders, supporters and especially our consultants – most notably Jimm Reed of Coho for project management, Chris Walker & Andrew Jarman of Native Architects for their design skills in delivering the Lowfield Green Resident brief and Liz Watson of LAND Design for the beautiful landscape designs. Below are a couple of links to recordings of the meeting if you’re interested in seeing it play out..
…the whole session is SEVENTEEN minutes long though so if you want to avoid hearing James BANG ON on about how great we are (!) and fast forward to the bit where The Committee say nice things..
Lowfield Green Resident Group celebrating the result!! Detailed Planning submitted for Lowfield Green! YorSpace is pleased to announce a Full planning application to finalise the design of the homes at Lowfield Green was submitted on 21st December 2018 – The application has been validated and YorSpace & the Lowfield Green Residents Group are looking forward to sign off at the end of March 2019! The planning reference is 18/02925/FULM – full details of the application can be seen via the link here where people can comment on the proposals. Outline Planning permission granted for Lowfield Green! FOUR years after first forming as an organisation… YorSpace can excitedly announced that we have planning permission for our proposals at Lowfield Green – Acomb! …and the votes are in! Planning committee approved with only one objection. Oh my… @CommLedHousing is on its way to #york!!! Lowfield Green, the former Lowfields School site, is where YorSpace are looking to develop York’s first cohousing community. The site is currently owned by City of York Council and YorSpace have an exclusivity agreement in place to purchase a portion of the site. The Council is developing the remainder of the site to include other types of houses, bungalows, an Elder Persons Care facility, a Health Hub and an open green space. An Outline planning application for the whole site was submitted by City of York Council in 2017 and on the 16th August, the City of York Planning Committee approved plans for the wider City of York Council development, which included the Community self build plot prioritised for YorSpace to develop. YorSpace have been in discussions with City of York Council since October 2016 about developing a portion of the site to create 19 homes in the South East corner – the area identified as “Community Build Plot” on the plan above. James Newton from YorSpace spoke to the press after the committee meeting and there is a link to the York Press article story on the decision HERE. The YorSpace team are continuing to work hard on finalising the design and are looking forward to completing the purchase of the site and appointment of the contractor to carry out the works later in 2018… #WatchthisYorSpace! Power To Change Community Shares Booster Programme grant award! YorSpace have been awarded a grant through Power To Change, the independent charitable trust given £150million from the Big Lottery Fund to support and develop community business for charitable purposes. The £10,000 grant will go towards YorSpace’s first development of 19 environmentally sustainable, cooperatively owned, community focussed homes at Lowfield Green, Acomb. A special thank you goes to our Director, Sue Bird for her efforts in completing the application for YorSpace! We’re delighted with the award of the Power to Change Community Shares Booster Programme grant! It will help YorSpace develop our community share offer, allowing people to invest in community led development in York. We’re bringing a new offer of development finance into the city, which will help lower the development costs of Lowfield Green and help us deliver homes that are accessible to a greater pool of people on diverse incomes. The next step for the YorSpace team is to finalise our business model and share offer in order to achieve Community Shares Standard Mark accreditation ahead of launching the offer in the second half of 2018. If you’re interested to know more about future investment opportunities then please join our mailing list through our investment page HERE. 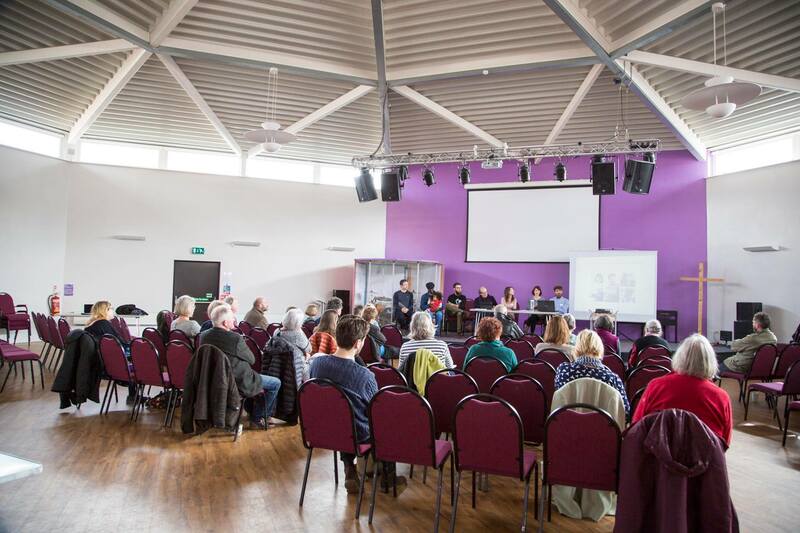 On 22nd April, YorSpace and York Community Energy put on a joint event to talk about what community energy is and how creating community-owned renewable energy can part of a community-led housing project. Hosted at Clements Hall we had a great turn out and were pleased to have Carbon Co-op, LEDA & Lancaster Cohousing come along and share their expertise on delivering community owned power. YorSpace and York Community Energy are keen to explore the possibility of delivering community energy in York and see Lowfield Green as a potential site for the city’s first community owned housing. More details can be found on the York Community Energy website where Rich Lane has done a great write up with details of the day in the link below. We had our first AGM! We had a solid turn out of both members and guests for the YorSpace 2018 AGM. After overcoming some technical hitches we were pleased (and relieved!) to be able to share with attendees our first year update. It was great for our Directors and Hub team to be able to connect with a good number of members – one of our key priorities for the coming year is to engage outwardly more often and we look forward to getting together more regularly in the coming months! For those of you who couldn’t make it we have a summary of the Directors report we shared HERE and for Minutes from the day, please click HERE – We’re looking forward to an even better second year! A huge welcome to the New Board! We can excitedly announce that we now have SIX members that have now formed our Board of Directors.. a great sign of our project and team growing in both stature and skills! If you were unable to make it on the day, details of the Vote and introductions to the new Board members can be found in this summary document HERE along with amusing photos of us all too! Teaming up with York Community Energy! Click the poster for more details! Please join us at our first ever AGM, which is being held at The Gateway Centre on 24th March 2018 at 11am. Our first community housing development at Lowfields is progressing well. We have a site. We have the support of the council. We have started the planning process. We have secured over £100,000 worth of funding and we now have nearly 90 members! This event is a celebration of community housing and the potential that YorSpace has to change the way housing is delivered in York! If you have not met us before, it is also a great chance to come along and say hello. We are keen to share our experience with other groups and interested people so please do come along even if you aren’t members or interested in being a resident! There will be tea & coffee available. After the meeting we are planning to walk over to the site for people who are interested in seeing where the proposed site is. Sign up to say you are coming via the link HERE. We look forward to seeing you there! If you are a YorSpace member you are entitled and encouraged to vote in the elections to the Board of Directors! YorSpace were delighted to welcome members and guests who came to Acomb Explore to hear an update on progress with the project, see the latest plans for Lowfield Green and engage with the discussion around defining housing need and our Allocation’s policy – we had great feedback from the people who attended and engaged with the workshops, which will feed directly into our new and improved Policy. Members were able to ask our team questions about progress with the design, the business model and join the YorSpace working teams that help drive the project forward. After a busy day for our core team (we had a design workshop with our Architects in the morning) the group followed the meeting up with a visit to the Lowfield Green site. Backed by Power to Change! YorSpace is delighted to announce the first of a flurry of successful funding applications that were approved at the end of last year to kick start 2018! Power To Change recognise the work YorSpace is doing as a community business that is run by and for the local community using our profits to make the local area a better place to live, work and visit! The funding covers our legal, project management and deposit costs for purchasing our first housing development site at Lowfield Green!